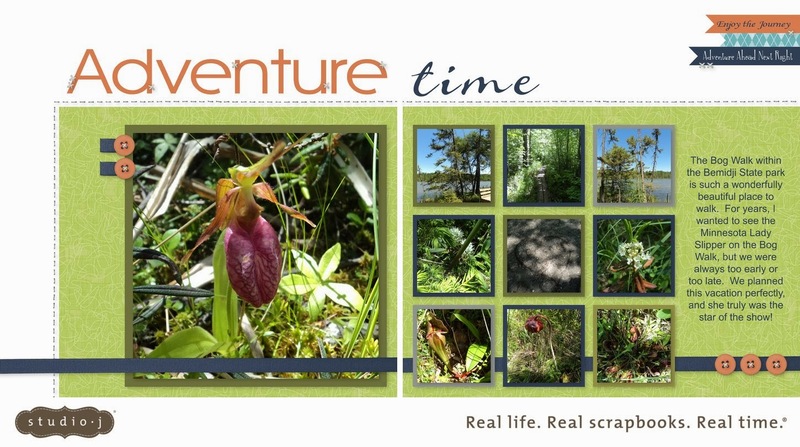 Have you been looking for a way to catch up on your scrapbooks? Maybe you have a vacation or event with a lot of photos. Or maybe you are in need of several photos that are not the standard size. This month is the PERFECT month to give Studio J a try! From now until March 31st, Studio J layouts are just $5 - even the Express and Photo Express Collections!! Let me show you two different types of layouts that I've done in Studio J. The first layout is one that I created by choosing my own template and paper. I was able to add bunches of flowers and brads, change colors as I liked, and then added a nice sentiment box. My grand niece is about as cute as can be, and I foresee scrapping a lot of pages of this little sweetheart! The next page is from one of the Express Collections. I like these collections a lot because the page is all ready to go. All I need to do is pop in photos and journaling, and it's done! If you haven't given Studio J a try, I encourage you to go in and create a FREE account. You can create layouts and play as much as you'd like. You don't pay for anything until you check out! At $5.00 for a two-page layout, this is a steal! If you'd like to see more of my examples today, just go up to the search bar and enter Studio J. Your search will bring you loads of examples of the work I've done! Keep watching this month for new layouts! Now let's talk about the March Stamp of the Month, Happy Place. What a cute little set of nesting dolls with lovely sayings for your scrapbook pages or cards! As always the Stamp of the Month is just $5 with a $50 purchase! Here's a card I made using the March Stamp of the Month, some Lollydoodle paper, and Skylark fabric. I've colored the nesting doll with our alcohol markers. Thanks so much for stopping in today! I hope that you have a wonderfully blessed weekend! Gorgeous pages and your little niece is adorable. Love your pretty card too. What a precious little baby. Love your beautiful card, too. Good morning! Congrats! 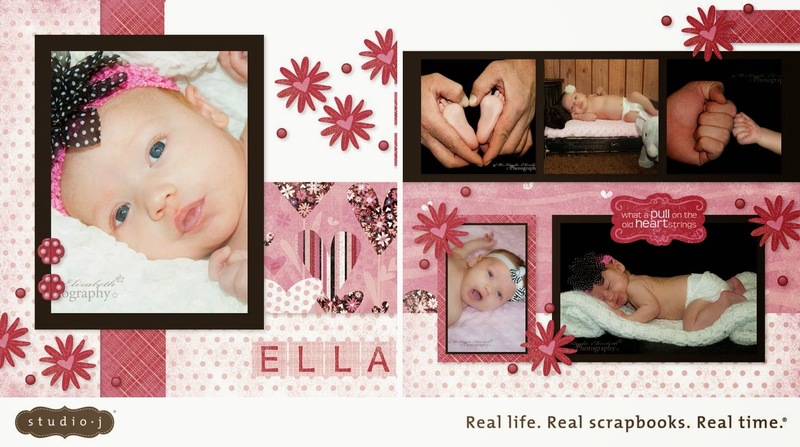 You were selected as the Featured Layout designer on our blog at Sketch~n~Scrap! Be sure to stop by and grab your badge from the sidebar, kudos to you!